"This recipe is from my friend Vicki. 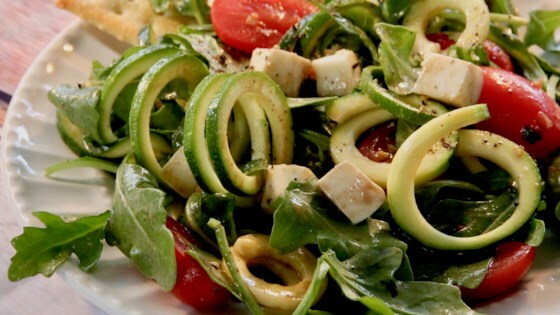 A simple summer arugula salad with zoodles, tomatoes, mozzarella, and basil." Cut zucchini into spirals using a spiralizer (fitted with the large shredding blade). Cut zoodles into smaller pieces. Combine zoodle pieces, mozzarella, tomatoes, and vinaigrette in a bowl; mix well. Refrigerate until ready to use. Just before serving mix in arugula and basil. This delicious update of the Italian salad adds fresh spinach. You can use baby spinach instead of arugula. I might on a real hot day but it is not a family favorite. Loved this fresh salad. I used carrots, zucchini and a lettuce mix I had on hand. It was so good. Easy to make, light and delicious. A hit with the whole family.